2411 North Rocky River Rd. Visions Landscape Supply & Design is Charlotte's premier landscape supply yard and outdoor living design center, located in Monroe, NC. We are minutes away from Waxhaw, Charlotte, Weddington, Wesley Chapel, Indian Trail & Matthews. We are dedicated to bringing you the ultimate landscape experience by offering bulk landscape materials such as dyed mulch products, double hammered hardwood, pine bark nuggets, cedar, cypress, playground chips, SC Pine Needles, mortar sand, white beach sand, natural stone, Mexican beach pebbles, river rock plus quality hardscape products. It doesn't end there,we can also accessorize your entire outdoor living area with items such as AOG, Fire Magic, Delta Heat & Twin Eagles gas grills, Primo ceramic smokers, fountains, poly lumber Adirondack furniture, glazed planters and much more. Fine Edge Landscape Design & Privette Enterprises. Together we have over 70 years of experience with our top management team. Not only can we provide all of your landscape materials, we have specialized services available such as custom landscape design/build, grading, excavating and delivery services. We are now able to provide the Greater Charlotte area with everything needed to complete almost any landscape project. Take a quick look at some of the products you will find at Visions Landscape Supply & Design! ​Please click on the itemized tabs at the top of the page to see more inventory choices and information. Dyed Brown, Red & Black Mulch. Cedar, cypress, playground chips, double hammered hardwood, pine nuggets also in stock. 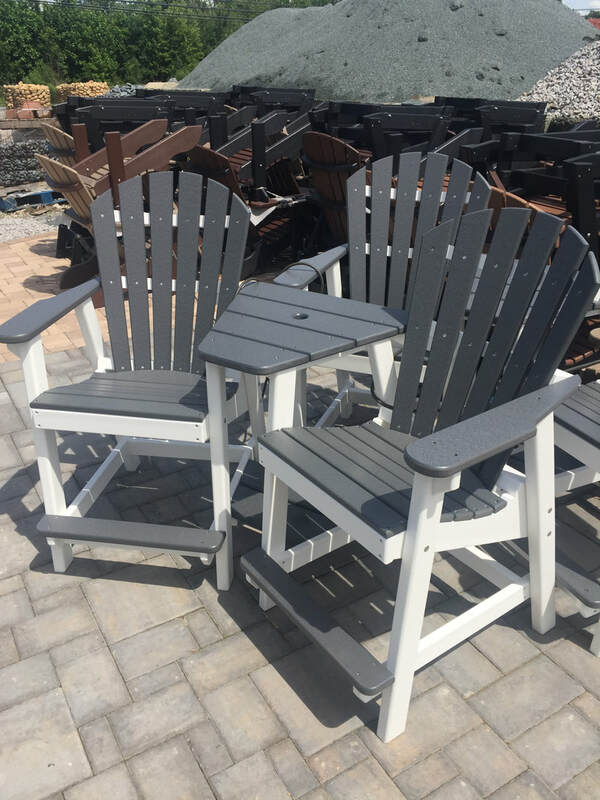 Poly lumber Adirondack chairs, gliders, benches, tables settees and much more. 12 colors to choose from. Large natural stone selection. Sold by the pallet or by the pound. Kinetic wind spinners, concrete statuary, fountains, metal wall art and much more! Decorative stone and river rock in many assorted colors and sizes. Grey/ white frame Adirondack settee. New color!